As I read ‘Kin’, I kept thinking of friends and family who I wanted to share it with, fans of murder mysteries, fans of character driven stories, fans of historical fiction. This book would appeal to all of them. The title gives away the name of the one person in the large cast who isn’t likely to be murdered or to be the killer. Helga Finnsdaughter is the adopted daughter of Unnthor and Hildigunnur, a happily married couple who have already raised a family of four and are enjoying life as well respected farmers. Unnthor is the unofficial local lord, he has a productive farm and the loyalty of the men in the surrounding area. Hildigunnur has a reputation for wisdom and knowledge, along with a broad mind and a quick tongue. We know little about Helga’s past, other than she was adopted twelve summers ago, when she was too young to remember her own family, and that her father was named Finn. Doubtless we’ll find out more in later volumes. Helga is clearly very much loved by her adoptive parents, and liked by the family retainer Jaki and his son Einar, who she sees as a big brother. The story is pretty much character driven, and the plot anchors on the legendary Unnthor’s Hoard, the fabled cache of raided treasures from Unnthor’s Viking years. The tale starts with the return of all four of Unnthor and Hildigunnur’s adult children to the farm. It’s been a long time since they left, and Helga hasn’t met any of them before. The three sons and one daughter return with their wives and husband, and four grandchildren. This gives us a pretty large cast, and the book is structured to allow slow introductions to the dozen or so potential victims and killers. With the exception of a couple of the wives, who are thinly sketched, the characters are well defined and engaging, and I particularly liked the relationship between Helga and her adoptive mother. Hildigunnar is an expert in human behaviour, and Helga is her mother’s keen and willing student, a detective in the making. Although all the action is set within the confines of Riverside Farm, we learn quite a lot about the politics and powers that be in the wider world, and I hope that we’ll find out more about this in later books. When a body is found, it’s obvious that suspicion must fall upon a clan member; and as the story progresses, Helga realises that a pragmatic and ruthless streak in the family is putting an innocent in danger. She has to work quickly to reveal the guilty party and help her adoptive parents keep their honoured place amongst the local farmers. With such an interesting group of characters, I found myself returning to the book frequently. It was a fun read, and I’d recommend it. 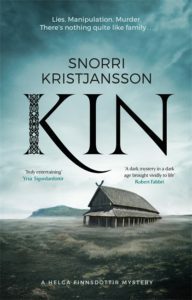 ‘Kin – A Helga Finnsdottir Mystery’ is available now.